I would like to present some information about how our Time Limited Campaigns (TLC’s) work. TLC’s are campaigns that run for a limited amount of time, hence the name. You will find them announced in the weekly update thread of the forums if there is a TLC this week. Here you can read a brief description of each campaign, review which technologies are available in the associated Prize Packs, and activate whichever Campaigns they would like. 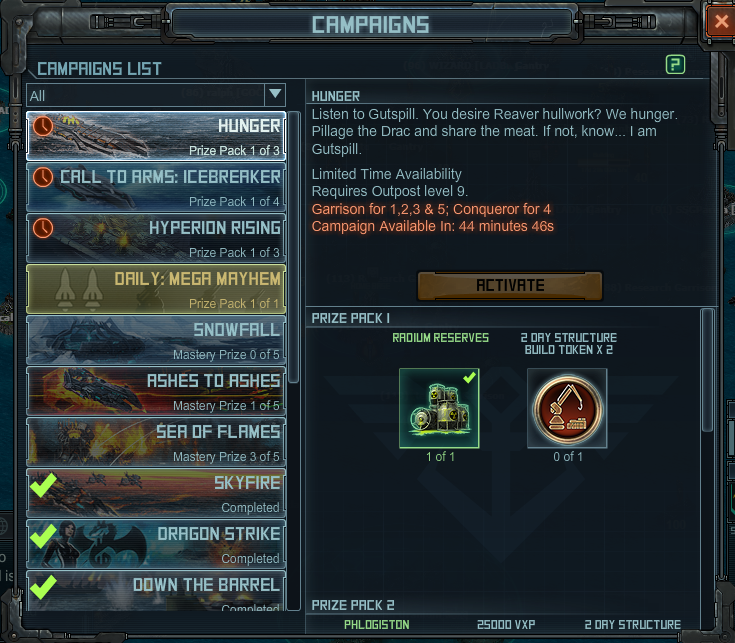 You can identity the TLCs from other campaigns by the red clock icon to the left of the Campaign Name. You may only have 3 Campaigns active at any given time, though there is no limit to how many can be attempted beyond that. Please note that TLCs have an end time listed in Weekly Update thread. If you start a campaign and the TLC expires while you are running it, you will not receive the reward. Once you click the beacon you will see additional information about the campaign. You will be able to see suggestions of what fleet to bring, what the next prize pack you will unlock is, as well as your Encounter Progress. Now captains you have completed your briefing on TLC’s get out there on the high seas and collect those prize packs! Honestly, I appreciate the effort but I don't think this is really going to help anyone... It's not very hard to understand how they work. What? Don't like information being easily accessible to newcomers? How about not increasing the damage output every time a TLC is rereleased. Ranking the Monos would make a huge difference. At least he is trying to give us info. It might make a small difference compared to where they are ranked now. Probably not noticeable. Looks like he had a driving mishap, otherwise this is about what I get with NO charged armor. Another Mono would then make a huge difference. I'm on prize pack 3 and spent one coin. I would suggest one M and one X charged armor for your tank and one X armor for each ship. Yea it kinda stinks you need it but yes you need it. Once you get past the first couple levels you can do it just like the RAID and outrange the turrets. Look for areas where you can splash the target not head on, like torpedo towers and splash the turrets. Once you learn the patterns it's not so bad. Oh and BTW I'm almost 60 years old so if an old man can do it you should be able to as well. So there's hope for us 53 year disabled old farts. Nice job writing this. Now, please write an article about defense/deflection. Questions about deflection bypass, and %resist pop up all the time and most of the official answers are floating around as random comments, which are super hard to find. Also make sure to talk about stun resist and splash reduction, because the community is still quite divided on the issue of how it's calculated. Seriously. Whats wrong with this type of post for any new comers? Seriously whats wrong with it? Jog on if it is not relevant for you. Seriously. Major Rampage take note of this post, please. Think about the players coming up behind the top level players. They get screwed with every re-release. I understand the re-release is made harder so that the tokens aren't free for the big boys. But your are losing those on the verge of becoming big by keeping the tech just out of reach. Consider making the first release on all new tech campaigns into a regular unchanging campaign. Then do tlc's for tokens etc.. and ramp those up for the big boys. Unless you really are just milking the game till it's shut down. Thanks for your base name. looking forward to your level 50. Damage is up across the board, and the 1 hr TLC's are designed to be coin fests. Like they don't think after hitting 100's of Garrison targets that it isn't easy to figure out. You big, tough pirate you. I had a gridiron mono fleet 'evaporate' doing the TLC - in th eadapted 113 round - and due to some other problems too, ran out of time (again). I am now convinced that some of these bugs may not be entirely accidental - I was ahead of the curve having used IBs with GM crew for the early rounds - something like 48 mins available for the last 3 rounds - and having switched to a gridiron mono fleet (my zelos also instantly went up in smoke for some reason in the round after) - I should have had plenty of time to complete the campaign. 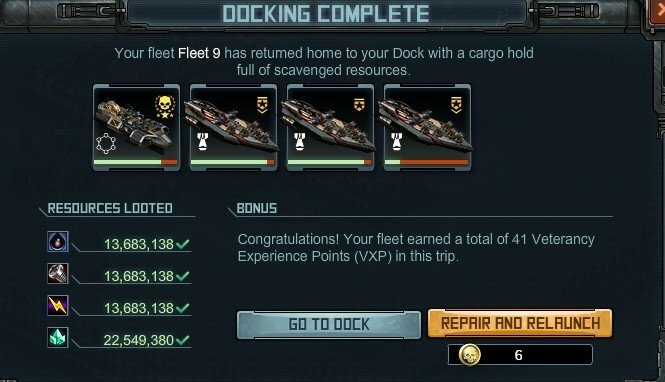 However - having ships do strange things or instantly die in PvE rounds I have done before is suspicious: the prize should considerably exceed the repair cost compared to buying tokens and somehow, I do not seem to get the tokens despite patience, determination and repairs to reasonable builds. Nah - something is wrong. For crying out loud....at least rampage is taking the time to share some info and tips pertinent to the game,and especially new comers. When I first read your reply I honestly thought you said "new coiners"
I do like what he is doing, but it would be nice if he closed the topic so there would be no comments from all that knows everything better. theres no new comers kixeye is making a job at it and losing lots of old players and why close comments , they dont want to hear us , closing your ears to customers is a doom business , so if he let us comment , he can have an idea of the game problems and maybe he can fix them , but i doubt it because at the end kixeye do whatever they want. I don't see a problem with MR posting stuff like this. But i do think its reasonable to think that if they don't know how to activate a TLC they probably don't have the fleets to participate. One of the first things people learn is to activate regular campaigns - and the difference is, or at least should be, obvious. After a few tries this week, and all the previous TLC's. One word for kix. NO. keep it. all. There is absolutely no reason to have that damage set so high on the first incursions to the set. You can set that damage however you want. But its my choice to play it, I choose not to. So no revenue for kix at all from me. High damage in the last targets of a set are expected. but not the first.